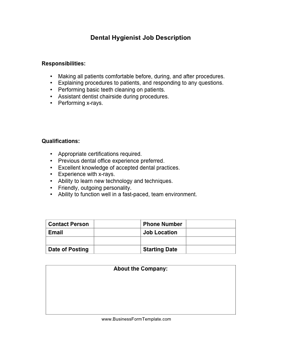 Use this dental hygienist job description to advertise for positions in a dentist's office, or to bring new hires up to speed. My safe download promise. Downloads are subject to this site's term of use. Subscribe to my free weekly newsletter — you'll be the first to know when I add new printable documents and templates to the FreePrintable.net network of sites. Making all patients comfortable before, during, and after procedures. Explaining procedures to patients, and responding to any questions. Performing basic teeth cleaning on patients. Assistant dentist chairside during procedures. Previous dental office experience preferred. Excellent knowledge of accepted dental practices. Ability to learn new technology and techniques. Ability to function well in a fast-paced, team environment. DISCLAIMER: The business forms and letters contained on BusinessFormTemplate.com are not to be considered as legal advice. All content is for informational purposes, and Savetz Publishing makes no claim as to accuracy, legality or suitability. The site owner shall not be held liable for any errors, omissions or for damages of any kind. This Printable Business Form Template is available to download for free, or you can download the entire collection for only $47. The free version is available in your choice of DOC or PDF formats. The DOC version can be opened, edited, and printed using Word, Google Docs, etc. The PDF version can be opened and printed with Adobe Acrobat Reader. The $47 version includes all of the Printable Business Form Templates on this site, in DOC and PDF formats. After purchase, you can download them and use just a few business forms or the entire collection. See the differences between the free and paid versions. If you don't see a Business Form Template category that you want, please take a moment to let us know what you are looking for. Thank you for your suggestion. We're always adding new printables, and would love to hear your suggestions. What are we missing?